Abby is a member of the class of 2021. This is her second year as a staff member of the Green Wave Gazette. Formerly a staff reporter, she was elected to the position of Public Relations Manager in her sophomore year. Abby participates in soccer, basketball, and enjoys playing saxophone in the school band. 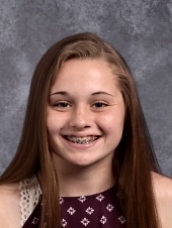 In addition to those athletic and music programs, Abby enjoys writing for the school newspaper about events in and out of Abington High School. Abby's first story as a freshman was One School, One Community. After high school, she plans to attend college, and she took a course on journalism at Harvard during the summer of 2018. Abby's hope is that you find the articles in the Green Wave Gazette interesting and enjoyable.